طالبی توتی, روح الله, چوداری خامنه, امیرمحمد, احمدی, رضا. (1396). تحلیل سه بعدی انتقال توان صوتی در پوسته های استوانه ای جدار ضخیم از جنس کامپوزیت لایه ای. 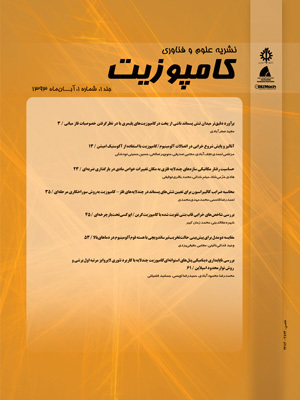 علوم و فناوری کامپوزیت, 4(1), 53-66. روح الله طالبی توتی; امیرمحمد چوداری خامنه; رضا احمدی. "تحلیل سه بعدی انتقال توان صوتی در پوسته های استوانه ای جدار ضخیم از جنس کامپوزیت لایه ای". علوم و فناوری کامپوزیت, 4, 1, 1396, 53-66. طالبی توتی, روح الله, چوداری خامنه, امیرمحمد, احمدی, رضا. (1396). 'تحلیل سه بعدی انتقال توان صوتی در پوسته های استوانه ای جدار ضخیم از جنس کامپوزیت لایه ای', علوم و فناوری کامپوزیت, 4(1), pp. 53-66. طالبی توتی, روح الله, چوداری خامنه, امیرمحمد, احمدی, رضا. تحلیل سه بعدی انتقال توان صوتی در پوسته های استوانه ای جدار ضخیم از جنس کامپوزیت لایه ای. علوم و فناوری کامپوزیت, 1396; 4(1): 53-66. در این مقاله یک مدل تحلیلی برای محاسبه­ی انتقال صوت از یک پوسته­ی استوانه‌ای کامپوزیتی ارایه شده است. بدین منظور از یک مدل جدید و دقیق برای حل سه­بعدی افت انتقال صوت در پوسته‌های استوانه‌ای از جنس کامپوزیت لایه­ای و بر پایه تئوری الاستیسته خطی استفاده شده است. مدل ارائه شده در مقاله حاضر، یک پوسته­ی استوانه­ای کامپوزیتی با ضخامت دلخواه و طول بی­نهایت و غوطه‌ور در سیال است که یک موج صفحه­ای مایل به سطح خارجی آن برخورد می‌کند. بر این مبنا با استفاده از روش موسوم به فضای حالت و به‌کارگیری مدل لایه­ای تقریبی به‌همراه رویکرد ماتریس انتقال، به تحلیل افت انتقال صوت از این پوسته­­­ها پرداخته شده است. نتایج حاصله با نتایج سایر محققان مقایسه شده و تطابق مناسبی بین نتایج مشاهده می‌شود و بر دقت مدل ارایه شده در این مقاله صحه­گذاری می­نماید. همچنین در انتها پارامترهای موثر بر افت انتقال صوت نیز بررسی شده است. بررسی­ها نشان می­دهند که پوسته‌های استوانه‌ای از جنس کامپوزیت لایه­ای از مزیت بیشتری نسبت به دیگر مواد برخوردارند، زیرا با تغییر در نحوه آرایش و چیدمان لایه‌ها و همچنین جنس ماده به‌کار رفته، مقدار افت انتقال صوت بهبود می­یابد. بنابراین از این نکته می‌توان به افزایش مقدار افت انتقال صوت در پوسته‌های کامپوزیتی بهره‌گیری نمود. In this paper, an analytical solution is presented to study acoustic transmission through a laminated composite cylindrical shell. Therefore, a new and exact model is employed to solve the three-dimensional sound transmission loss in a composite cylindrical shell based on three-dimensional linear theory of elasticity. The model presented in this paper is a composite cylindrical shell with arbitrary thickness and infinite length and immersed in a fluid. Also an oblique plane wave impinges on the external sidewall of the shell. The state space method is used to investigate laminate approximated model along with transfer matrix approach to analysis the sound transmission loss though the composite cylindrical shells. The results obtained from presents study have been compared with those of other researchers. This comparison shows an excellent agreement between the results. Finally, the parameters affecting on the sound transmission loss have been studied. The results indicate that the laminated composite cylindrical shells are more advantageous rather than other materials as a result of enhancing the sound transmission loss with change the stacking sequence of laminated composite. This characteristic can be used to increase the amount of sound transmission loss in composite shells. Smith, JPW., “Sound Transmission Through Thin Cylindrical Shells,” Journal of the Acoustical Society of America, Vol. 29, No. 6, pp. 721-729, 1957. White, PH., “Sound Transmission Through a Finite, Closed, Cylindrical Shell,” Journal of the Acoustical Society of America, Vol. 40, No. 5, pp. 1124-1130, 1966. Foxwell, JH. and Franklin, RE., “The Vibrations of a Thin-Walled Stiffened Cylinder in an Acoustic Field,” Aeronaut Q; Vol. 10, pp. 47–64, 1959. Koval, LR., “on Sound Transmission Into a Thin Cylindrical Shell Under ”Flight Conditions”,” Journal of Sound and Vibration, Vol. 48, No. 2, pp. 265-275, 1976. Koval, LR., “on Sound Transmission Into an Orthotropic Shell,” Journal of Sound and Vibration, Vol. 63, No. 1, 51-59, 1979. Blaise, A. and Lesueur, C., “Acoustic Transmission Through a 2-D Orthotropic Multilayered Infinite Cylindrical Shell,” Journal of Sound and Vibration, Vol. 155, No. 1, pp. 95-109, 1992. Blaise, A. and Lesueur, C., “Acoustic Transmission Through a 3-D Orthotropic Multilayered Infinite Cylindrical Shell. Part I: Formulation of The Problem,” Journal of Sound and Vibration, Vol. 171, No. 5, pp. 651-664, 1994. Blaise, A. and Lesueur, C., “Acoustic Transmission Through a 3-D Orthotropic Multilayered Infinite Cylindrical Shell. Part II: Validation and Numerical Exploitation For Large Structures,” Journal of Sound and Vibration, Vol. 171, No. 5, pp. 665-680, 1994. Lee, JH. and Kim, J., “Study on Sound Transmission Characteristics of a Cylindrical Shell Using Analytical and Experimental Models,” Applied Acoustics, Vol. 65, No. 6, pp. 611-632, 2003. Tang, YY. Silcox, RJ. and Robinson, JH., “Sound Transmission Through Two Concentric Cylindrical Sandwich Shells,” In: Proceedings of the 14th International Modal Analysis Conference. Japan 1996. Daneshjou, K. Nouri, A. and Talebitooti, R., “Sound Transmission Through Laminate Composite Cylindrical Shells Using Analytical Model,” Arch Appl Mech, Vol. 77, pp. 363-379, 2007. Daneshjou, K. Nouri, A. R. and Talebitooti, R., “Analytical Model of Sound Transmission Through Laminated Composite Cylindrical Shells Considering Transverse Shear Deformation,” Applied Mathematics and Mechanics (English Edition), Vol. 29, No. 9, pp. 1165-1177, 2008. Daneshjou, K. Shokrieh, M. M. Moghaddam, MG. and Talebitooti, R., “Analytical Model of Sound Transmission Through Relatively Thick FGM Cylindrical Shells Considering Third Order Shear Deformation Theory,” Composite Structures, Vol. 93, pp. 67-78, 2010. Shojaeefard, MH. Talebitooti, R. Ahmadi, R. and Gheibi, MR., “Sound Transmission Across Orthotropic Cylindrical Shells Using Third-order Shear Deformation Theory,” Latin American Journal of Solids and Structures, Vol. 11, pp. 2039-2072, 2014. Talebitooti, R. Ahmadi, R. and Shojaeefard, MH., “Three-Dimensional Wave Propagation on Orthotropic Cylindrical Shells With Arbitrary Thickness Considering State Space Method,” Composite Structures, Vol. 132, pp. 237-254, 2015. Rjabi, M. Ahmadian, M. and Jamali, J., “Acoustic Scattering From Submerged Laminated Composite Cylindrical Shells,” Composite Structures, Vol. 128, pp. 395-405, 2015. Daneshjou, K. Talebitooti, R. and Tarkashvand, A., “Analysis of Sound Transmission Loss Through Thick-Walled Cylindrical Shell Using Three-Dimensional Elasticity Theory,” International Journal of Mechanical Sciences, Vol. 106, pp. 286-296, 2016. Qatu, MS., “Vibration of Laminated Shells and Plates,” Elsevier Academic Press, 2004. Reddy, JN., “Mechanics of Laminated Plates and Shells Theory and Analysis,” 2nd ed., CRC Press, 2003.